At the West Calhoun Apartments, what was once used for storage is now a stylish, fun space for residents to gather. The project was completed as the result of a fantastic collaboration of creative people and ideas. KMS Management professionals had the idea to convert the space into a lounge, we helped pull several elements of the design together, and Myrna Orensten of Imaginality Designs designed and installed a beautiful acrylic wall art divider for the space. The aim in creating this space was to add value for the residents who live there. In keeping with the trendy Uptown/Lake Calhoun area (West Calhoun Apartments is right on the lake), the look is an eclectic mix of industrial, vintage and contemporary styles. We selected colors for the walls, ceiling and accents. The wall colors are bright and fresh, contrasting with the dark exposed beams. Reclaimed wood on the feature wall adds texture, interest, warmth, and enriches the industrial feel. The ceiling is exposed, but panels were added strategically, and painted the same color as the light neutral on the walls, to visually lift the energy of the room. The floor is decorative stained concrete with warm brown tones. Colorful paint choices for the walls also set off the artwork (which we re-purposed form other areas in the building) and work seamlessly with the design of the colored-textured acrylic wall art divider, since we collaborated on color selection. The piece provides a functional divider, while still letting light into the room from the entrance. For furniture, we were able to save money by taking the booth and table out of another KMS complex and re-using it; it works great in this space. We also added a new retro sofa and chair, a colorfully upholstered bench for additional seating and completed the room with lamps and another colorful accent – an area rug to ground the space. Residents can relax in the lounge, socialize, watch TV and enjoy the convenience of a coffee bar. We created a place for things to happen, which otherwise would not have been possible, and it’s a cool space to be in. I would highly recommend Metro Interiors to any firm, to enhance their space or begin as new. 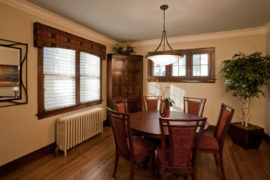 Julie Ann has worked with KMS Management on designing and remodeling our properties for over 10 years. She is respectful of our ideas but has just the right flair for enhancing what we may suggest or what we hadn’t thought of. The projects turn out beautifully and will stand the test of time.